Nickelodeon must have recently hired a whole gaggle of twenty-something jr. executives. You know, the ones who say things like "schedge" and "profesh" but not ironically. The ones who are almost certainly identical to Jon Ralphio on Parks and Rec. But despite the awfulness of their personalities they must also have brought along with them something all true 90's children share: a reverence for 90's television. What brought me to this conclusion, you ask? I'll tell you. This year, everyone's favorite network whose logo is just an orange splotch is bringing back not one, but TWO shows of our childhood: Figure It Out AND Teenage Mutant Ninja Turtles. Never mind the fact that Nickelodeon is touting Figure It Out as an "all-new show" to an audience who doesn't know the difference, like when Alien Ant Farm redid Smooth Criminal and it was number one on TRL for weeks. Never mind that they have replaced Billy the answer-board-head with plasma screens to appease a generation who never had to tape a show on VHS. They are making mini celebrities guess what mediocre children do in their spare time and pouring buckets of green goo on them if they slip up, and that's just good television. No word yet on if Summer Sanders is making an appearance, but I'm thinking she's probably available. With a name like that, your choices of other occupations are pretty much limited to exotic dancer, TV Guide channel host, and professional girl scout. TMNT looks pretty similar in concept but it's CGI now, so the turtles are significantly cuter than they were before. They look a little more like a muppet-babies version of the old cartoon. Their heads are smaller and rounder, their voices are higher and you kind of would rather hug them than hide behind them. At least I would. How can they eat human-sized pizza when their mouths are so small? How adorable would it be to see them try? But no matter. The heroes in a half-shell are back, which means you can resume your argument with your younger sibling on whether Michelangelo or Raphael (or Leonardo I guess) is better. 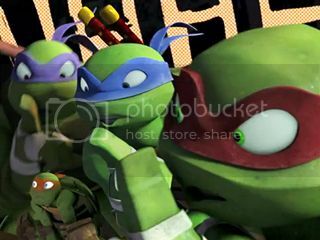 (No one likes Donatello. Let's just be honest. He had a stick.) I always chose Raphael, but I also chose the blue power ranger and Eeyore. So underdogs are kind of my thing. What other 90's shows should Nickelodeon revive? Older PostAn Amateur Analysis of Disney/Pixar's "Brave"